Henry took his first major spill today. 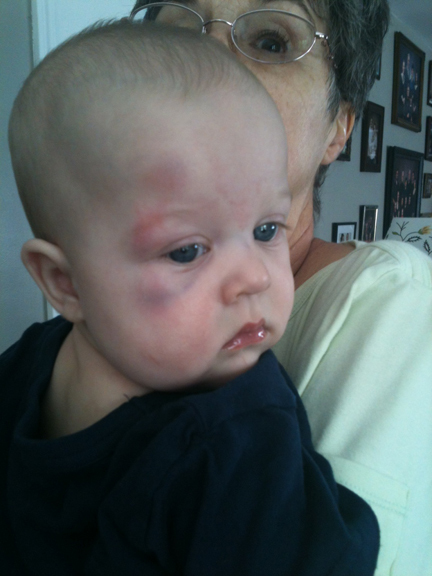 He tumbled out of my mom’s arms (from a pretty low height) and bruised his face. He was having a helluva morning. I took him to the doctor to make sure he was ok. He seemed fine, just upset. He kept stroking his fingers under his eye and then crying. By the time we got to the doctor’s office, his forehead began to show a bruise, too. Fortunately, his pupils were dilating symmetrically and were equally responsive. He had no interest in reaching for the doctor’s stethoscope when she dangled it in front of him. He preferred to stare balefully at it instead. However, he did reach for his car seat toys, which he held onto until we got into the car. The doctor ordered a CT scan, because he’s so young. He turns 6 months old tomorrow. He was very brave during the CT scan. I think he rather enjoyed watching the imaging module spin around. His sinuses got a little swollen from his near-constant wailing before we got to the doctor’s, so he was snorting as he wound down. He snorted while getting his CT done, and that made him cry a little bit, but otherwise he was laid still and quietly. I was holding his head to help him keep it still, and after he snorted and cried, he looked backward at me and held my hand. I asked the nurse in the pediatrician’s office what I should do next time (since there will obviously always be a next time). She said to ice the spot (or use a cold washcloth), but not to worry about dosing him with Tylenol (we don’t like to use medication with them, since they are so young, if we can help it.) We call immediately if he bleeds, vomits or loses consciousness. We watch him if not. He can sleep if he is responsive (we jiggle him a bit and if he startles or rouses, it’s ok. If he isn’t responsive, then he comes in immediately). I joked that my husband and I would have to start a pool to guess when he’d need his first stitches and I said I had picked after age 4. The nurse laughed and said her son needed his first stitches at 18 months and then for the next 18 months had to come in every 6 months (approximately) because he just kept getting into scrapes. Meanwhile, I have an appointment later today for his twin at the dermatologist’s office because she has been fighting a nasty rash for weeks now. She’s fortunately beginning to clear up but I actually suspect she’s having a very mild allergic reaction to the cream she’s on now. A nice result from all this is that I will be able to bring Eleanor in to see the ultrasound tech who worked with us all during my pregnancy and she will then get to see both Henry and Eleanor in one day (since she works in the same area as the CT scanner). My sweet little babies. Life has just been a roller-coaster for them since birth, it seems. UPDATED: One of the results of Henry’s CT scan is in, and his brain is normal. Still waiting to hear about his face bones. It’s strange how it feels to see one of the babies not feeling well. I cuddled Henry during my lunch hour, and got him to give me a ghost of a smile. Then, when I settled him into the swing to take a nap, he couldn’t stop grinning at his elephant toy. And he fell asleep within a few minutes. Little trooper. UPDATED: Face bones are fine.